By Sean Jones: An offer has been made to #3 WBA, #8 WBO Brandon Adams (21-2, 13 KOs) as the opponent for former IBF/IBO/WBA/WBC middleweight champion Gennady Golovkin’s next fight in June on DAZN, according to Mike Coppinger. There are other fighters that are also being considered for GGG’s next fight, but the 29-year-old Adams is said to have been given an offer. Adams a respectable fighter. He’s twice taken part in ESPN’s Boxcino tournaments, losing both times to Willie Monroe Jr. and John Thompson. Adams has won his last four fights since losing to Thompson by a second round knockout in May 2015. It makes sense why Golovkin would face someone like Brandon Adams on DAZN instead of someone that could potentially give him some problems like WBO champion Demetrius Andrade, Jermall Charlo, Sergey Derevyanchenko, Billy Joe Saunders or Jack Culcay. There’s a lot of money to be made in the Golovkin v. Saul Canelo Alvarez trilogy fight in September on DAZN. 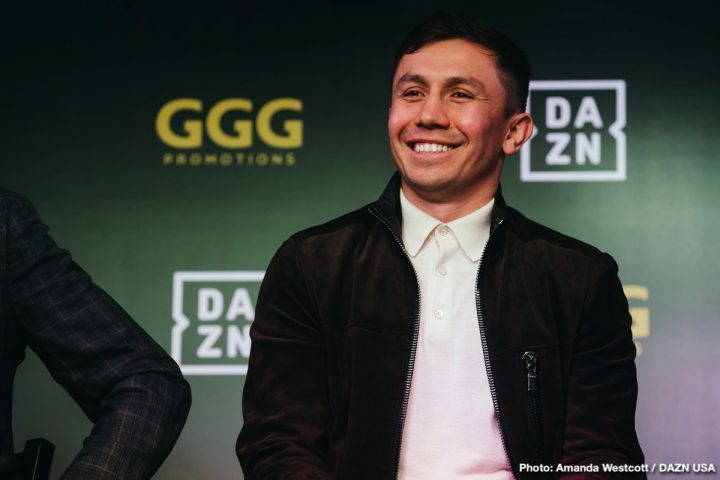 It would be a bad idea for GGG to be matched against someone that could potentially get lucky with the right crew of judging and defeat Golovkin, as we saw with Canelo last September. With a different set of judges working both Canelo-GGG fights, Golovkin could have easily won both fights instead of fighting to a 12 round draw in the first fight and then losing the second fight. The bad thing about Adams getting a fight against Golovkin is the fact that he was easily beaten by one of GGG’s past knockout victims Willie Monroe Jr. in 2014 in ESPN’s Boxcino tournament. Monroe Jr. schooled Adams in beating him by a one-sided 10 round unanimous decision by the scores 99-91, 99-91 and 99-91. It was a complete shellacking by Monroe Jr. in making Adams look bad. The next year, Monroe Jr. was knocked out in six rounds by GGG in 2015. Adams’ 2nd round knockout loss to John Thompson also looks bad, as Thompson was beaten by Liam Smith by a 7th round knockout in 2016, and then beaten by Monroe Jr. and Eric Walker. It would look bad if GGG were to face Adams rather than someone else. The highly rated #2 WBC contender Kamil Szeremeta has been mentioned recently as a possible opponent for GGG to fight in June. The boxing fans have been less than excited at the thought of watching Golovkin fight Szeremeta, however. The fans see this fight as a mismatch, and feel that Golovkin is just looking to pad his record with a weak opponent. Either way, GGG is going to take a lot of heat unless he fights someone that has some talent.